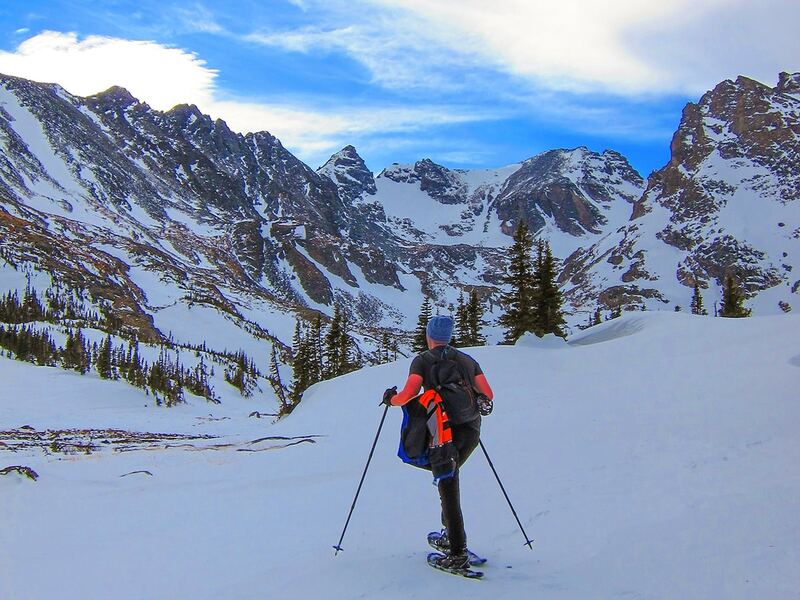 A winter hike or snowshoe along Lake Isabelle trail not only takes you to a beautiful alpine lake with views of Isabelle Glacier but will often lead you to find yourself in solitude, breaking trail, and spotting an abundance of wildlife. From Boulder, Colorado (1 hour, 40.4km), take Lee Hill Dr. Turn onto Lefthand Canyon Dr. heading west towards the Town of Ward. Drive through the Town of Ward until you reach the end of Lefthand Canyon Dr., at the junction with CO-72 Peak-to-Peak Highway. Turn right onto CO-72 and almost immediately turn left onto Brainard Lake Rd. Follow Brainard Lake Rd. to the entrance gate that is closed for the winter season. Park at the Brainard Lake Winter Lot.  Camping is allowed in the backcountry, no permit required. Begin the hike to Lake Isabelle from the main entrance gate following the Brainard Lake Road, past Brainard Lake. At a split in the road, hike up Long Lake Rd. to the Pawnee Pass Trailhead. Hiking along the road from the entrance gate will add about 6.4km to the overall trip but this area, covered in snow, is incredible. Hiking the closed, snow-covered road seems like a winter hike all on its own. 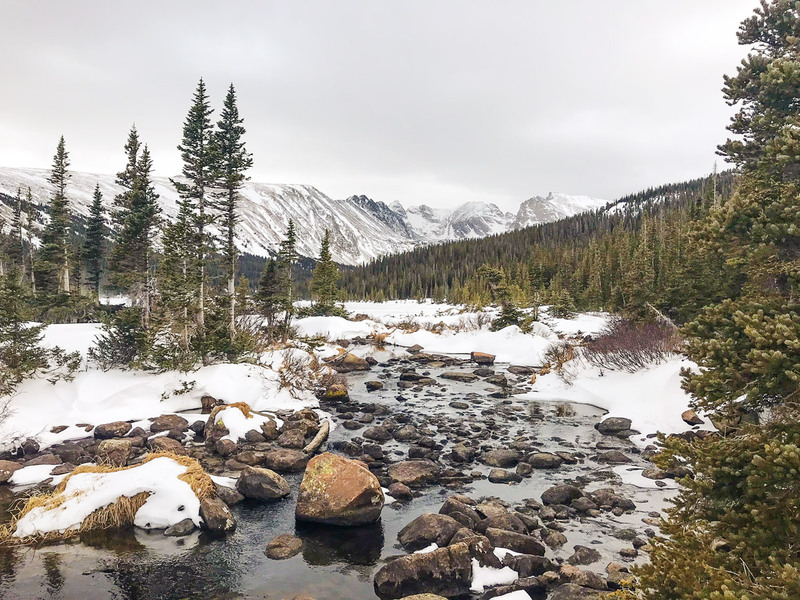 Lake Isabelle Trail itself is a 7.1km heavily trafficked out-and-back trail located in the Brainard Lake Recreational Area within Indian Peaks Wilderness. From the Pawnee Pass Trailhead, the trail gradually ascends through the forest until reaching the tip of Long Lake. 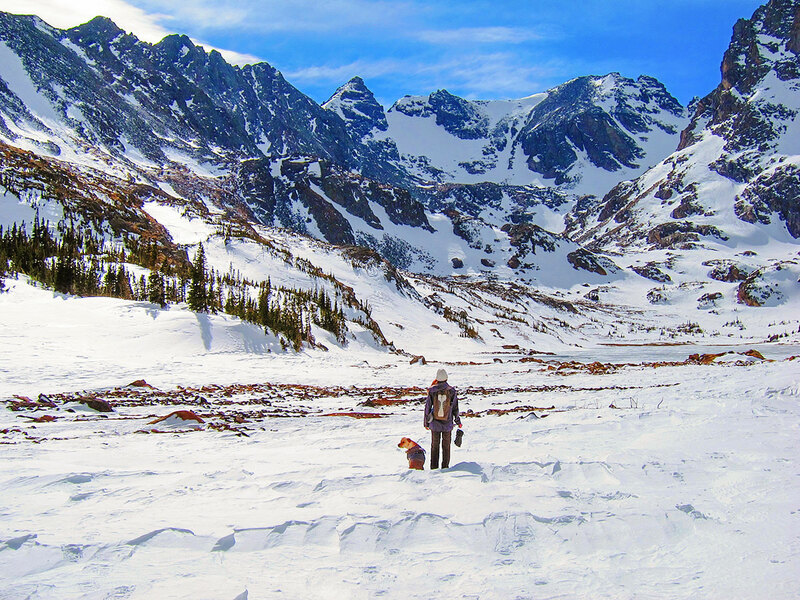 At Long Lake, the views open up and you should be able to see Isabelle Glacier and the surrounding Indian Peaks. Stay on the north side of Long Lake as you hike parallel to the shore. You will understand why it is called Long Lake as you continue to hike along the shore further back into the mountains. Past Long Lake, the trail gains elevation and slowly ascends above the tree line. A few exciting switchbacks get you above water runoff waterfalls and to the amazing views of Lake Isabelle and surrounding mountains. Navajo Peak (4087m) is the most prominent mountain in the middle of the mountain cirque. This section of Isabelle Lake trail is exposed to the elements, so be prepared for high winds and winter storms in the afternoon and evenings. If this trail is hiked early or late in the season, expect there to be ice instead of snow, make sure to bring traction. 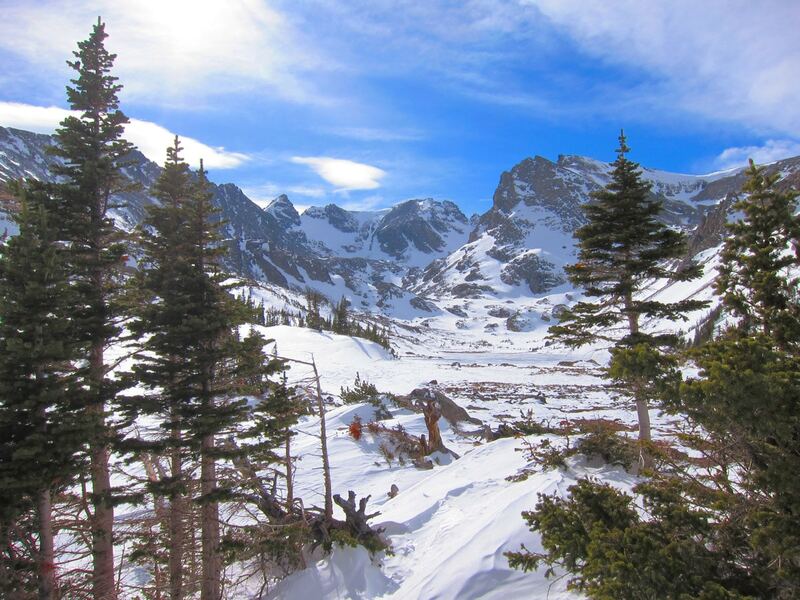 Once you reach Lake Isabelle enjoy the stunning views, then return the way you came. If you get to Lake Isabelle and you have more in you, continue on to Isabelle Glacier. 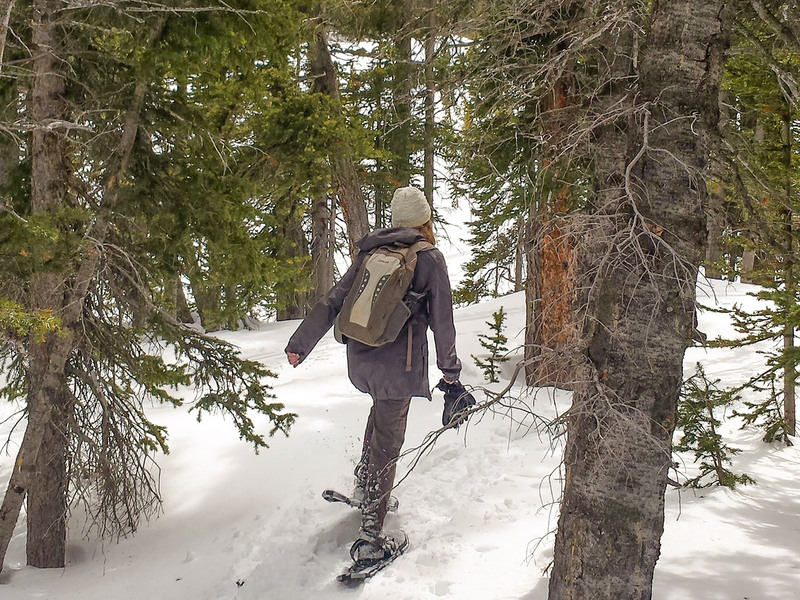 Snowshoes for the Isabelle Lake Trail can be rented in the Town of Nederland at Happy Trails Café or Wild Bear Ecology Center. 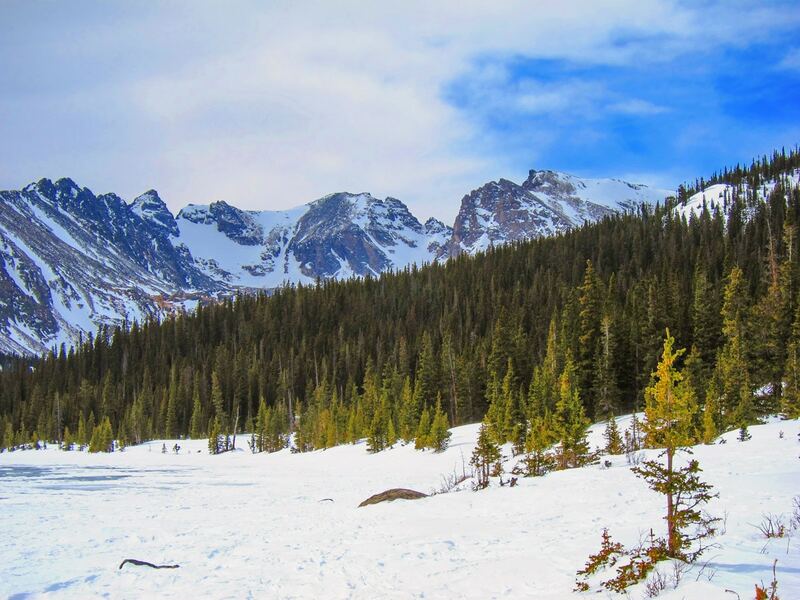 Check out seasonal updates about the Brainard Lake recreation area here.